A DRP is a contract between an insurance company and a collision repair shop. 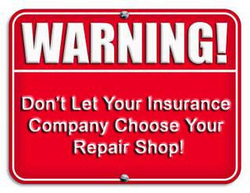 It is considered a contract of adhesion, as the insurance company sets the terms, conditions, and obligations of the repair shop, and the shop owner can take it or leave it. There is usually no room for negotiation. Insurance companies can provide a lot of business to a shop, and they know this, and since there is no shortage of shops that would love to be in the DRP, the insurance company can be extremely strict on it contract terms. Direct Repair Is a way for insurance companies to make more money. They direct their customers to a body shop willing to do a job at a largely discounted rate. These discounts force the direct repair body shop to cut corners in order to make a profit. These cut corners result in a poor quality repair. Direct Repair is a way for insurance companies to make more money. don't fall for it, bring your vehicle to a reputable body shop. Bring your vehicle to Gongoras body and paint! Gongora's is known for our quality workmanship and ability to beat our competitors prices.... GUARANTEED!!!!! !